The Department of International Relations and Cooperation (DIRCO) is responsible for South African foreign policy decisions and conducts liaison with foreign governments and international organizations on all matters affecting official relations. These relations are conducted through foreign government officials, through diplomats accredited to South Africa, and through South Africa's accredited embassies, consulates, and other missions abroad. After the abolition of apartheid and the inauguration of the democratically elected Government of National Unity, South Africa's foreign relations were dramatically transformed. The country's diplomatic isolation ended, and existing relations with other countries and with international organizations improved. South Africa's return to the international community from 1994 onwards has made a significant contribution to the definition of the general direction of the country's foreign policy. initiated negotiations with the European Union (EU). Apart from the formal multilateral re-admission of South Africa to the world community, other inter-state and inter-government actions characterized that return. Diplomatic relations have been concluded with 78 states since 1994, and South Africa had diplomatic relations with at least 147 countries in the mid-90s. a commitment to the African Continent. South Africa was one of the original 51 founding members of the United Nations. The United Nations General Assembly decided on 12 November 1974 to suspend South Africa from participating in its work, due to international opposition to the policy of apartheid. During the late seventies and early eighties UN Security Council sanctions were instituted against South Africa and it was barred from officially participating in United Nations related bodies. Financial support was also provided by the United Nations to national liberation movements. South Africa remained on the agenda of both the UN General Assembly and the Security Council during the struggle against apartheid. The democratic elections in South Africa in April 1994 paved the way for the complete normalization of South Africa’s relations with the UN. 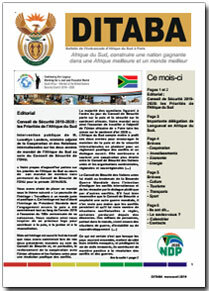 Since then South Africa has participated actively in all aspects of the work of the Organization. Its global status has increased significantly through participation in numerous UN bodies, agencies and General Assembly sessions. Democratic South Africa is thus a strong supporter of multilateralism and respects the current system of governance based on the United Nations and its various bodies. These institutions serve to combine the international community’s strength to maintain international peace and security and employ multilateral institutions for the promotion of the economic and social well-being and advancement of all peoples. South Africa is also of the view that this is the legitimate and credible system through which other major global issues such as food security, disasters, refugees, international crime and disarmament could be effectively addressed in a collective manner. In October 2006, South Africa was elected by the Members of the General Assembly to serve, for the first time in its history, as a non-Permanent Member of the Security Council for the period 2007-2008. The election to the Council offered South Africa the opportunity to advance the African agenda of achieving peace, security and development, including respect for human rights. South Africa also regards the Security Council as a platform to help promote multilateralism and respect for international law as the most appropriate means of achieving global political and economic stability and security. The 14th Ordinary Session of the African Union held in Addis Ababa on 31 January – 2 February 2010 endorsed South Africa’s candidature as Africa’s candidate for the nonpermanent seat on the United Nations Security Council for the period 2011-2012. South Africa was appointed again as a nonpermanent member of the Security Council in October 2010. As a nonpermanent member of the Security Council, South Africa will continue its efforts to promote and enhance the Security Council’s cooperation with regional organizations, particularly the African Union’s Peace and Security Council. Closer co-operation between these two bodies will contribute to enhancing the convergence of perspectives and approaches in dealing with and responding to peace and security challenges on our Continent. South Africa will actively contribute to the work of the Security Council by participating in its committees, working groups and other structures. Security Council membership will also present an opportunity to contribute to reforming the working methods of the Security Council and to work towards the achievement of a representative, legitimate and more effective Security Council.